This year mum and I decided to do a combined New Year lunch gathering to invite our relatives over for a festive lunch. We hope to take this opportunity to get touch and mingle with everyone since we seldom get a chance to eat together as a big group during normal days of the year. Silver Pomfret (Yin Chang - 银鲳鱼) or White Pomfret (白鲳鱼) is one of the seafood choice which is popular among the Teochew (a dialect group). And usually for a Teochew family like us, we love to include preserved salted vegetables, tomato and sour plums in our Steamed Silver Pomfret dish. But since I am re-create this dish for Chinese New Year, I decided to add in some Osmanthus flower which has a distinctive fragrance that enhance the flavour of this dish. During Chinese New Year, it is a must have for each household to have "Fish" as one of the auspicious dish which symbol "abundance" of good luck and fortune. And when it comes to fish, the best way is to either Steam or Poach whereby using the most least ingredients to draw up the natural flavour and sweetness of the fish. 1. Clean pomfret to remove any scales or intestines. 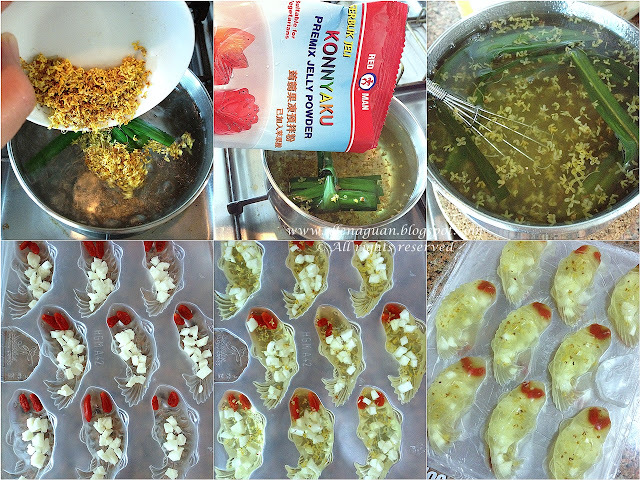 Rub pomfret evenly with salt and marinate for 5 minutes. 2. Place pomfret on steaming plate that consists half portion of shredded ginger and spring onion. 3. 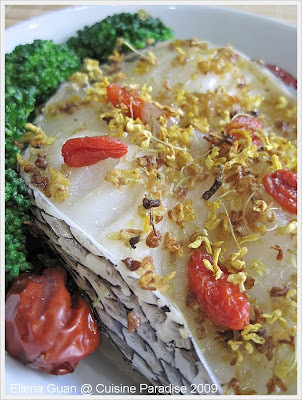 Arrange remainder ginger, spring onion and mushroom on the fish before scatter the osmanthus flower on it. 4. Steam pomfret over high heat for 10 – 12 minutes. Remove from heat, garnish with shallot oil and drizzle a cup (20ml) of Huiji Waist Tonic on the fish and serve immediately. 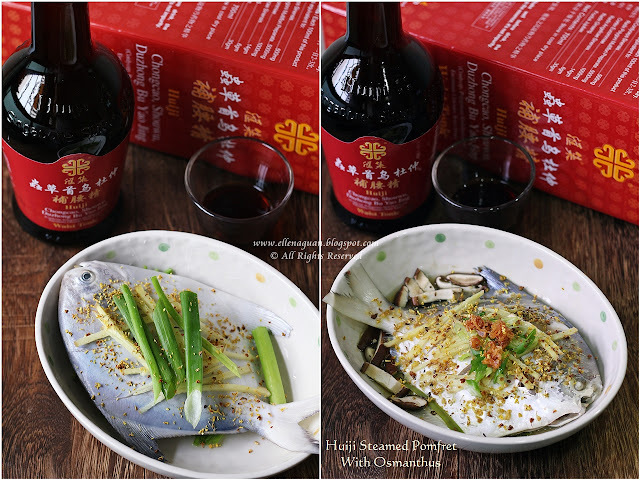 With my bottle of Huiji Waist Tonic that acts as a great helper in the kitchen, it definitely helps to boost up our health as well as enhance the flavour of the dish. For your information, Huiji Waist Tonic is now made in "Singapore" with a richer taste that filled with more goodness. 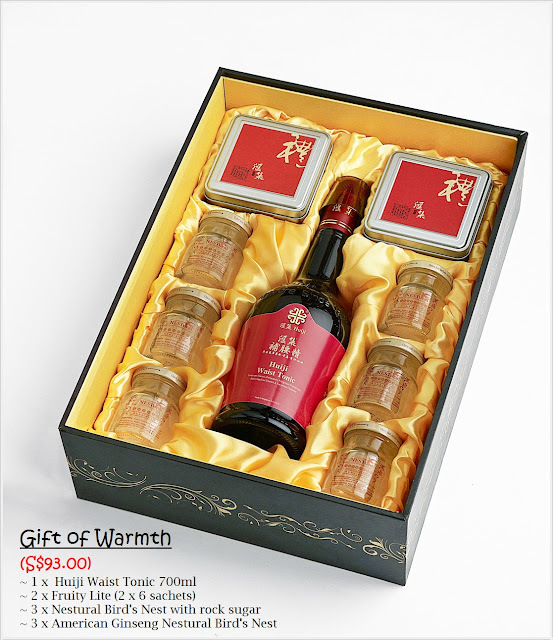 And for Lunar New Year, you can pamper your loved one with either their festive gift sets such as Gifts of Thought (S$53.00), Gifts Of Warmth (S$93.00, shown above) or Huiji Waist Tonic and Fruity Lite Bundle Pack (S$42.80) which helps to bring them health and beauty. 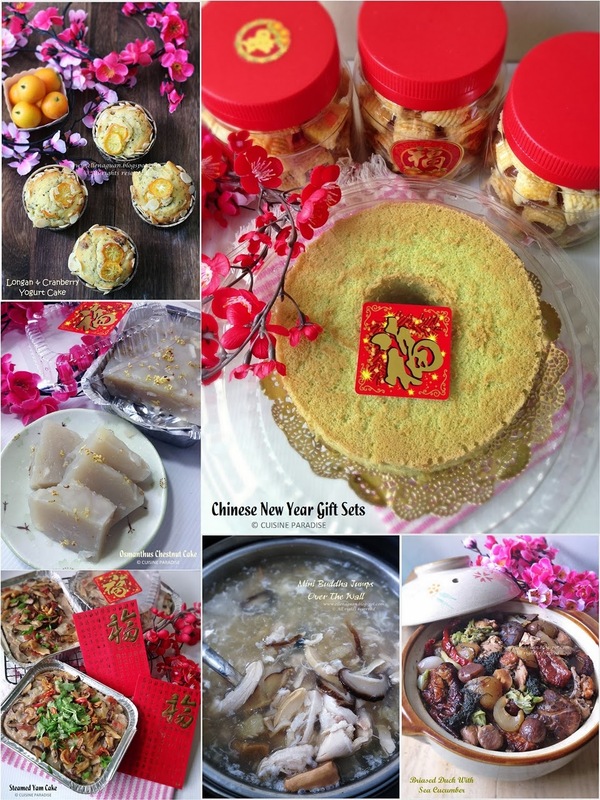 There are all kinds of Chinese New Year after meal desserts and the most common few are:- Yam Paste With Gingko Nuts, Red Bean Puree With Lotus Seeds, Tang Yuan, Chng Teng and etc...... But what I am going to share with you today is something really simple and yet it will impressed your guest with it's "Golden Outlook". I have named it "桂花元宝" in Mandarin which mean Osmanthus Ingots. 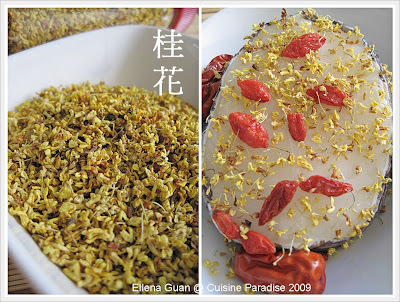 This recipe required 3 main ingredients which are Red Dates(preferably those HUGE one so that it will be easier to do the stuffing), Glutinous Rice Flour(the filling) and the most important ingredient "Osmanthus Flower - 桂花" which will brings out the floral fragrance of this dessert. And in order to sweeten this dish and enhance the flavour of the stuffing, I will make a syrup using "Rock sugar - 冰糖" and "Candice winter melon - 冬瓜糖". In order to slit open the Red Dates and remove the seed easily, it's best that you soaked it in warm water for about 5 - 10 minutes as to soften it. But if you wan to save the trouble of removing the seed, you can purchase those that is without seeds. I saw this HUGE red dates from one of the groceries stall near my area and it cost only $0.80 per 100g. With these detail photo above, I am sure it will give you a better ideas on how to prepare this Chinese New Year dessert. 1. 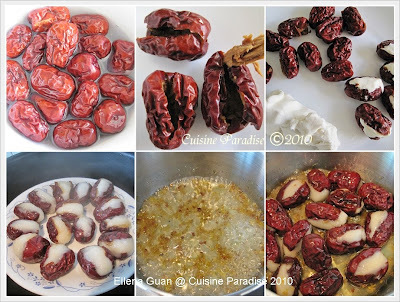 Rinse and clean away the soil/dirt on the outer skin of the red dates. 2. Soaked them in a bowl of warm water to soften it so that it will be easier to cut open and remove the seed in it. 4. Pinch about a marble size portion of the dough and stuffed it in each Red Dates. 5. Arrange the stuffed dates on a plate and steam it in a pot of boiling water on Medium heat for about 5 minutes. 6. When done, removed the dates from the pot, set aside to cool while preparing the Osmanthus Syrup. ~ For the procedure of the stuffing and steaming you can refer to the above photo for clearly explanation. 1. Bring water to boil in a small sauce, add in rock sugar and stir till the sugar melted. 2. 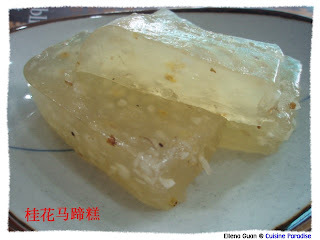 Lower the heat, add in chopped winter melon and Osmanthus Flower and let it boiled for about 15 seconds. 3. Add in the cooked glutinous red dates and stir it through the sugar syrup and simmer till the syrup became a bit sticky. 4. 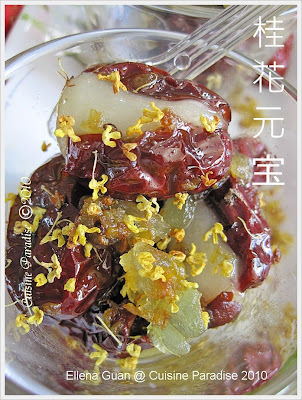 Off the heat, removed the red dates and served it in small serving cups, drizzle with some osmanthus syrup & chopped winter melon then sprinkler some extra osmanthus flower to enhance the fragrant and outlook. 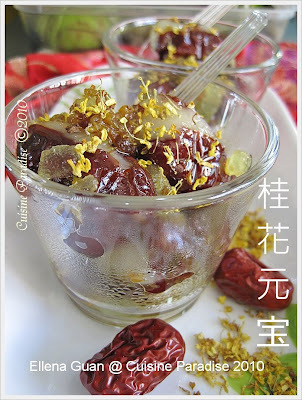 You can prepared all the ingredients and steps up to the steaming of the red dates and cooked the Osmanthus Syrup just before serving. Or alternatively, you can prepared everything and stored this dessert in the fridge and served it as a cold dessert. So no matter which method you prefer, I am sure this will make a great dessert for your guests this coming Chinese New Year. In about a month's time, there will be two great occasions that falls on the same day of 14th February 2010. And I am sure most of us is aware of this Special day which marks the 1st day of the Chinese New Year as well as the Western Valentine's Day. So on this day, most or maybe all the restaurants will be fully packed with people celebrating this double occasions. In this case, why not try to whip up something special for your family or love one at the comfort of your home. Since it is near towards the Chinese New Year season, I am sure whatever you have or going to prepare, you would want to give it some auspicious name. 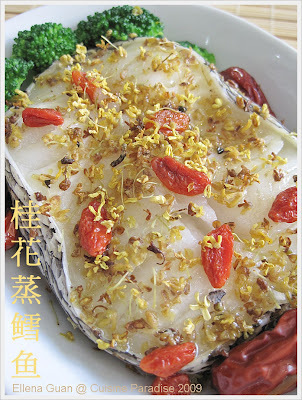 Today, we are going to prepare this "Osmanthus Cod Fish" with a translated name of "桂花蒸鳕鱼" which sounds like prosperous fish/become more prosperous every day(蒸蒸日上). For readers who has being following my post, you will have read about this Osmanthus flower which I have used it quite a number of time in making dessert or herbal drinks. 1. Clean and pat dry the fish, lightly marinate it with some light soy sauce and corn flour. 2. 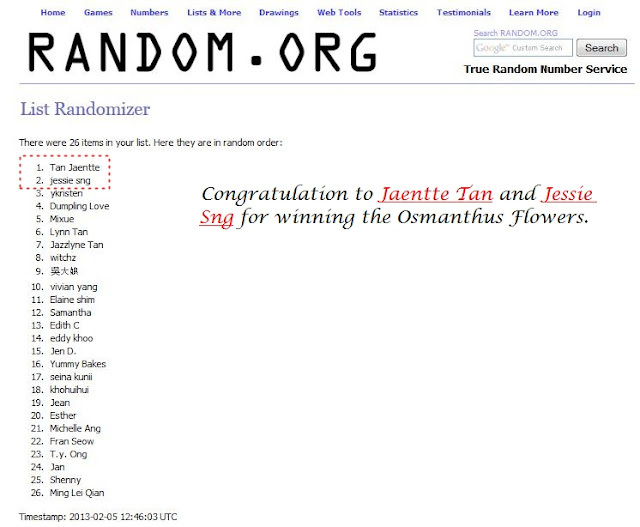 Next arrange the fish cutlet on a plate together with the red date, wolfberries and 1/2 of the Osmanthus Flower. 3. Prepare a steaming pot with metal rack, when the water boils, put the plate of fish on the rack and steam on medium high heat for about 5 minutes. 4. Remove the pot cover, drizzle mirin/glutinous rice wine on it, scatter the remaining Osmanthus Flower and continue to steam for another 2 to 3 minutes till the fish is cooked through. 5. Remove and serve with warm rice. ~ You can choose any type of fish fillet/cutlet that is suitable for steaming or to your liking. ~ The timing for steaming the fish will depend on the thickness, you can test it after 5 minutes of steaming time, using a chopstick/fork to test the center of the meat. Osmanthus is a highly perfumed flower, and it is well known that you can smell it nine miles away! It is a deliciously fragrant flowers which carry the scent of ripe peaches or apricots. Other than its refreshing fragrant, in the Chinese Medical terms, it is also used to reduce phlegm if you have a bad cough. Osmanthus is a highly perfumed flower, and it is well known that you can smell it nine miles away! It is a deliciously fragrant flowers which carry the scent of ripe peaches or apricots. In Chinese cuisine, the flowers are also used to produce osmanthus-scented jam (桂花酱), sweet cakes (桂花糕), dumplings, soups, and even liquor (桂花酒). Usually when we went for dim sum during the weekend, my hubby will order the water chestnut kueh which he loves it alot. 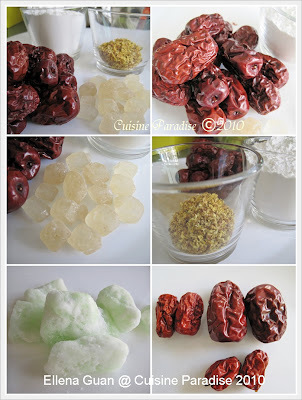 But then this is slightly different because of the Osmanthus fragrant infused into the kueh. It's rather a refreshing taste and it's up to individual whether you like that peachy or orange fragrant. Thanks Mandy from M4M to share with us this recipe. 1. 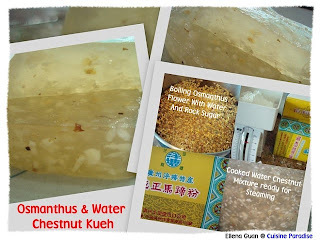 Boil water and add osmanthus flower reduce heat to simmer for 3 minutes, add in the rock sugar and stir till dissolved. 2. Cover and infused for 5 minutes. 3. Transfer about 250ml of flower tea(without the flowers) to a medium bowl and let it cool in a pot of ice water. 4. Before adding in chopped water chestnut to the pot of HOT flower tea, remove 1/2 of the Osmanthus flower in it and set aside. 5. After the bowl of flower tea and cooled down, stir in water chestnut flour and potato starch and sieve it into the HOT flower tea solution. 6. Keep stirring the mixture on low heat until slightly thicken like gluey form. 7. Stir in the oil and turn off the heat. 9. Cool it and put in the fridge to chill and unmould. a) You can get the water chestnut flour from most of the supermarket.